Earlier today a new blue plaque was unveiled by English Heritage, which has a very specific and rare difference from all the other plaques they have installed on the sides of buildings. The font the text was written in is the London Underground’s own New Johnston typeface — and that is because this plaque, on an otherwise average house in Leyton marks the birthplace of Harry Beck, designer of the now iconic tube map. I mentioned a couple of months ago that this January marked the 80th anniversary of the introduction of the now familiar tube map, and today, he got his own official blue plaque to commemorate his contribution to London, and indeed now, the world’s transport heritage. Although January marked the 80th anniversary of the introduction of the “map”, it was initially just as a fold-away pamphlet. This month marks the anniversary of when the map gained significant public awareness, as the first poster sized versions were deployed across the tube network. Some 2,500 posters in that first print run. So, today he got a Blue Plaque to mark the anniversary and his contribution to it. Design and Heritage Manager for London Underground Mike Ashworth. Harry Beck was born in 14 Wesley Road, Leyton, E10 on the 4th June 1902, although the family only lived there for about three years and soon moved to Highgate. 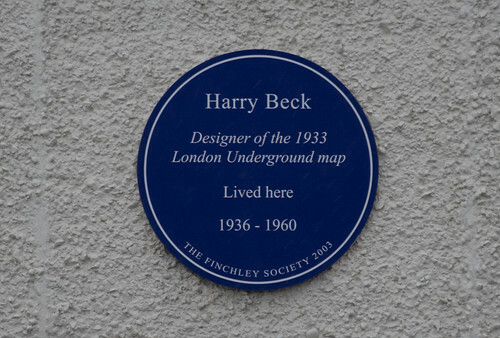 As an adult, and during his time working for London Underground though, Harry Beck lived near Finchley between 1936-1960. In fact, he is known to have lived at six addresses in London, before retiring to the countryside. 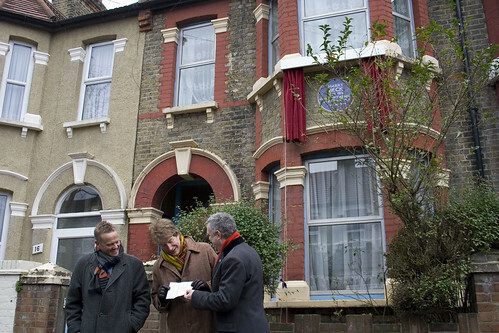 The question then is which of the six houses should get the official English Heritage plaque? In June 2003, the Finchley Society erected their own blue plaque on his home at 60 Court House Road — so that was ruled out. The other homes in Mill Hill and High Barnet were considered, but it was decided to mark his birthplace in East London instead. 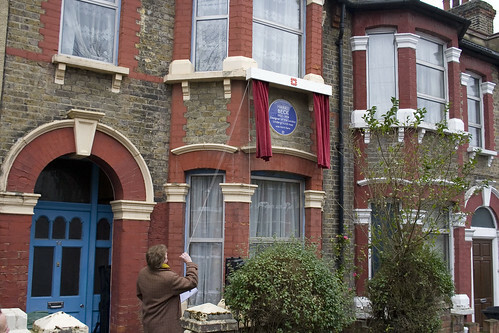 This is also the first Blue Plaque to be installed in Leyton. London Transport Museum Director Sam Mullins unveils the plaque. Another plaque had also been installed in 1994 to commemorate him at his local tube station of Finchley Central, where you can find it on the southbound platform, appropriately close to a modern day tube map. Apparently there used to be a copy of his original tube map in the display board — but I presume that confused customers, so a modern version is there now. Incidentally, when he lived in Finchley, there is also a bit of confusion about why, as he lived almost next to West Finchley station would chose to walk to Finchley Central instead. My personal opinion is that it is only about 10 minutes to walk to the further station along a rather pleasant road. West Finchley station is charming, but hardly the sort of place to loiter in the cold, and the local shops are limited to a small parade. The further station has a lot more shopping, and crucially, trains from both High Barnet and Mill Hill East passing through – so more frequent trains to catch. Personally, if I lived in the same area, I suspect I would also walk to the further station as well. 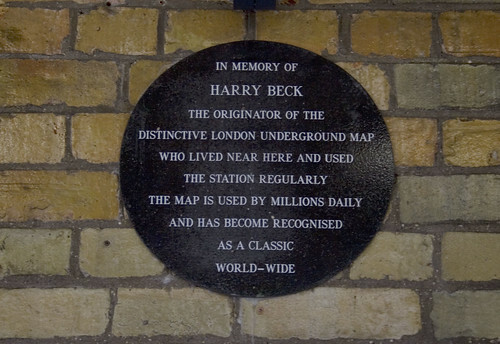 Harry Beck died in 1974 — and apparently still bitter over how the tube map was taken from his control in 1960. I suspect that like a lot of creators and designers, he felt it was “his baby” and refused to adapt the map to reflect changing needs. Just as his map was initially rejected as undesirable by LU management, he himself started to reject other map improvements as equally undesirable. His contribution to the concept of the schematic diagram for train networks — and loads of other services — is however now legendary. Oh, so that’s what a tube map looks like! Other London Underground related English Heritage blue plaques include Frank Pick at 15 Wildwood Road, NW11 (plaque erected 1981); Lord Ashfield at 43 South Street W1 (1984) and calligrapher Edward Johnston at 3 Hammersmith Terrace W6 (1977). All three — now four — are unique in being printed in the New Johnston typeface. The rest of the plaques since the design was standardised in 1938 use English Heritage’s own in-house font. It should also be noted that unlike other blue plaques, this one is in Johnston/Gill Sans, which are the typefaces used on the London Underground. Nice attention to detail here which wasn’t mentioned in the article. So they are still issuing blue plaques? In January, English Heritage suspended new applications for blue plaques in order to deal with the backlog of existing applications and review the funding of them to put future scheme on a sounder financial basis that is less onerous on the tax payer. West Finchley v Finchley Central – the latter does have a more frequent service as Mill Hill East and High Barnet branches of Northern Line have combined at that point. Not a massive difference in service frequency but perhaps enough to sway an otherwise marginal decision. He mentioned that in the article as well. Not true these days, of course, now the Mill Hill East branch is reduced to a mere shuttle outside the peaks. I disagree with your dismissal of Beck as a precious designer from whom control of the Tube map needed to be wrested. Just look at this rare unpublished 1961 Beck diagram – the only one he ever drew which included the Victoria line – and tell me you honestly think the mess LT eventually went with was an improvement on that. By the way, could you please edit the stylesheet to make links some other style or colour from ordinary text? I am not comfortable with dismissing an entire attitude based on one single example though. There is plenty of anecdotal chatter about his approach to suggestions in later years when asked to make modifications to the map he designed. @swirlythingy: It’s actually very well documented that Beck was summarily replaced as the designer of the Tube Map (read the excellent book, “Mr. Beck’s Diagram” for a full account, including increasingly angry letters between him and the Underground’s Director of Publicity). The first Beck knew about it was when he saw the new map, and he was none too pleased. All maps designed by Beck after this time (around 1960, off the top of my head) were unsolicited attempts to get his old job back. The beautiful Victoria Line diagram you reference above was returned to him without even a note. Beck was difficult to work with, and he certainly believed that he was entitled to work on the Tube Map for as long as he wanted to, but he certainly wasn’t averse to making changes. In fact, he was almost obsessed with constantly tinkering with the map to “perfect” it. @Cameron Booth: I know. I never suggested he was averse to making changes. Just look at the number of changes he had to make to that 1961 map alone! As for “his approach to suggestions in later years when asked to make modifications”, I submit that the reason for this approach was not just because he thought he knew best, but because he did, in fact, know best. The decision to label interchange stations once for each line, in particular, is bizarre. I am not disputing that the London Transport Board forcibly removed the tube map from Beck’s control – this is easily verifiable. I do not, however, believe that this was the right thing to do. I do not see Ian’s problem with Beck being reluctant to accommodate the management’s requests for alterations to be made, when the reason for his reticence was precisely because he thought the proposed changes would be to the detriment of the map, and I for one agree with him. Maybe you’re a Hutchinson fan, but I think you’ll find you’re in the minority there. strange coincidence – this is only 5mins walk from where I was born and lived until we got married! Ian, as ever ,an excellent report. I met you at the Dollis Hill bunker tour last year. 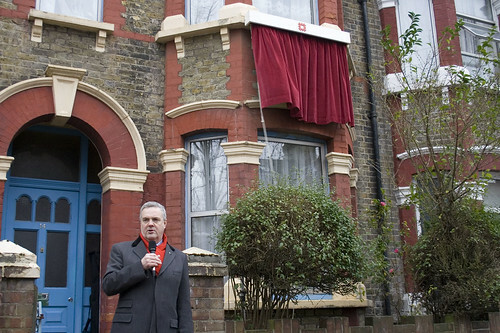 I live at 56 Courthouse Road and attended the unveiling of our plaque in 2003. I deduce the photo of our plaque was clealry taken in the last week or so, you should have popped in to see my vast collection of tube maps and tube map symbolism (adverts and suchlike) from around the world. I can probably verifty one way or the other as to whether Harry used West Finchley more than Finchley Central as I know one of the elderly ladies down our road who used to walk to the station with Harry each day. 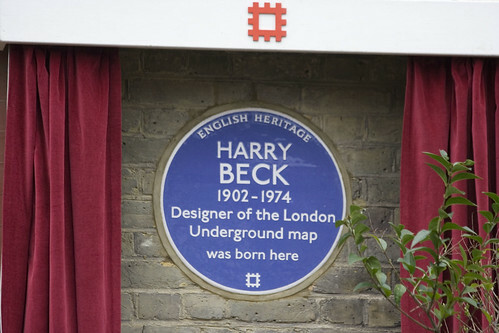 The person to speak to about Harry and his map obsession is Ken Garland the author of the definitive book, Mr Beck’s Underground Map. I’ve met Ken on a few occasions, hje used to give talks about Harry and the map.